The new tank was to be ahead of the Soviets on every scale – better armor, variable suspension height, missile firing capability, a heavy machine gun or light cannon for engaging light vehicles or helicopters, night vision sights, and a new and more powerful engine. It was also to have all crew members in the turret (three) and an autoloader to replace the human one in all Western medium tanks up to that time. Both countries would work together on the new tank design, and as a result would pool their efforts in the areas where they were best suited. The Germans offered the suspension and running gear, and the Americans offered their 152mm gun/launcher and the Shillelagh missile system then being fielded in the M551 Sheridan and M60A2 tanks. The US authorized the construction of eight prototypes, most of which were to be made of mild steel as proof-of-concept demonstrators. The fire controls left something to be desired, and many changes were made to the missile fire control system. An NBC filter/overpressure purge system was added during testing, and as a result the bore evacuator was discarded as unnecessary. The remote control 20mm automatic cannon proffered by the Germans was another headache and found to be unnecessarily heavy and awkward. 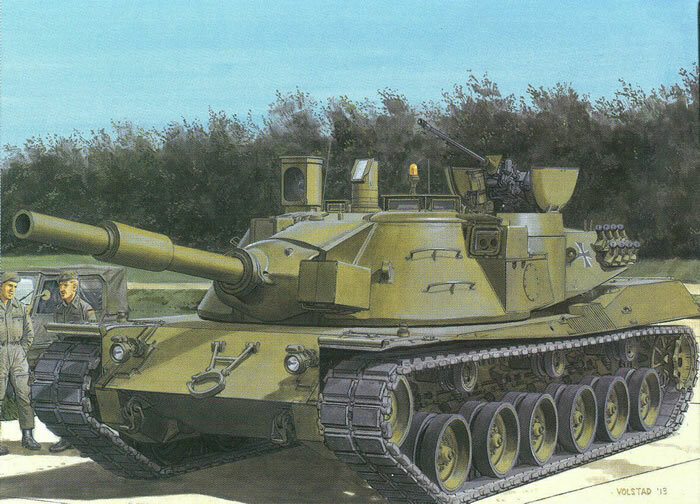 Finally, in late 1970 the MBT-70 project was cancelled. The Germans withdrew and began working on the Leopard 2 series tanks which emerged about a decade later. The Americans tried to come up with an austere version of the MBT-70, now dubbed the XM803, but it too failed and was terminated in June 1972. A total of 14 prototypes were built - eight US and six German. Of the US ones, only five were completed as MBT-70s and only two of them exist today (one was finished as an XM803 and another set of parts was assembled as a “gate guard” dubbed the “Pigg Tank” at Fort Knox). Only two of the German prototypes survive, but one at Koblenz in the Deutsches Panzermuseum is intact and nearly complete as built. I recently built the Commander Models MBT-70, a resin kit, but this is a totally new effort from DML and not a copy of that kit as alleged in some websites. It is based solely on the Kpz. 70 at Koblenz and a four-page color flyer is included with the kit to demonstrate that point. And this time DML appears to have hit all marks. There are a few minor bits missing such as the power cable from the turret to the searchlight (albeit the connector is visible on the model and in the photos) and a curious object on the turret (which I suspected was a sensor for the gyroscopic device that controlled the position of the driver’s station) is missing. But the rest seems to be here and all other items one would expect to find are present. The MBT-70 concept used a hydro-pneumatic suspension system and DML has done a very nice job of replicating it, including the hoses and fittings. While no jigs or guides are provided, DML does demonstrate that the modeler may adjust the “sit” of the model to match any of the positions that the original could take – nose down, nose up, high or low, or even tilted to one side. An alignment bar (part A45) is provided to get the suspension units in line. A small key used to set the suspension units for normal travel must be removed and an inset shows how and where to remove it from each suspension arm; ditto for the adjustable idler which must be rotated forward to take up the slack in the tracks. It must be pointed out that this kit will ONLY build the German version, and as such only comes with suitable parts for that tank. As noted I did a good deal of research on the MBT-70 with the resin one and this kit has the German lights, exhaust grille, convoy alignment marker, smoke grenade launchers, and other detail fittings. They are very nicely done but as noted are just for the German variant. Ditto for the upper hull which has twin fans not found on the US version. All three crew hatches may be posed open or closed, and a number of other items may also receive optional settings. The missile tracker may be set for open or closed, as well as the gunner’s sight and the commander’s night periscopic sight (assembly M, which is missing in the directions!) is provided in the “up” position; the German one may be fixed in the “up” position but the US one retracted into the turret when not in use. The searchlight is only provided as “closed”. The 2 cm Rheinmetall automatic cannon (which was a stick-on barrel on the resin kit) is presented here in its entirety; there are 16 parts to it and it may be left moveable in both traverse and elevation. It may be shown elevated or retracted, but DML does not provide any information on how to install it in the retracted position in the directions. As noted the model comes with two armored covers over the matching units for the twin antenna, which are totally different from the US VRC types used with the American tank. The bustle rack is neatly done and even though complex comes down to only three parts. While the trunnion mounts for this tank look toylike, after long study of the prototypes they are correct. Remember these were prototype tanks and the final design – which may well have looked more like the M1 Abrams or Leopard 2 – were not completed. The kit comes with the proper Diehl tracks but each run is in two sections; as always with DML DS Plastic you will have to fiddle with them to get a taught fit. However, each section comes with three attachment links (six in total) so you should be able to get both a good fit and a good joint (I clamp the tracks for 24 hours after using Testors Liquid Cement and have had excellent results). Two options are provided, both for test tanks; one with crosses on the turret and one with an unreadable registration plate and “48" bridge classification plate. The flyer shows the one in Koblenz with a simple German flag and “Y-“ on the plate so this appears to be correct. A small sheet of Cartograf decals with a number jungle is provided for those who find more precise information. Overall, while some may be disappointed that DML did the German version first this is a great kit and one which should be popular with Bundeswehr and Leo fans.